Dr. Trish and I live in Acworth, Georgia and are both from the rolling hills of rural Southwestern, Pennsylvania. We were high school sweethearts and have been married for over 23 years. Dr. Trish enjoyed eight years of Pediatric Nursing prior to shifting her focus to becoming a natural health Doctor of Chiropractic. As for my foundation, I earned a Bachelor of Science Degree in Biology from Saint Vincent College, where I also played four years of collegiate basketball. 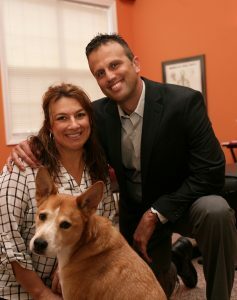 We both earned our Doctorate degrees in Chiropractic at Life College, right here in our own backyard of Marietta, Georgia. Spending time with family and friends is a must to us. 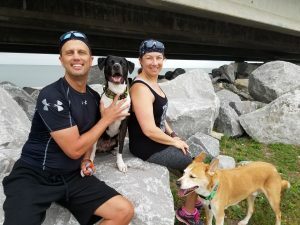 Fun time includes any outdoor activity or visiting with nature, whether it be running, biking, hiking, going to the shore or to the Blue Ridge Mountains. Our playful spirit really shines when we are loving on and playing with out three 4-legged “kids,” Nio, Tyko and Bugs! Once you get to know us, you will learn how passionate we are about fitness and nutrition. The best part is sharing our passion with others who are also interested in performing at their highest potential. Perhaps the most fulfilling times are the moments we share with our two amazing Godchildren, Jeremiah (8) and Saryiah (2). I coach Jeremiah’s youth basketball team while his baby sister cheers him on. Our passion and love for helping others “be the best they can be” are the foundation of Health Solutions. We strive for Excellence in all that we do from our services to how we treat people. Being Pittsburgh natives, our work ethic is outstanding and we give our 100% best effort 100% of the time. We hope that you will consider joining our Chiropractic Wellness Family so that together we can all share the best versions of ourselves with the rest of the community and world! It’s a wonderful, yet humbling, feeling to wake up and come to a place where life transformation is common place. There is nothing more inspirational than seeing someone proceed from anguish or ailment to relief and happiness. We refer to this natural, healing power residing in each of us as our ‘Inner Doctor.’ The quintessential question is: ‘how can I support this inner Doctor to work at its best?’ Dr. Trish and I have full-heartedly devoted our lives to this task! Since we opened our doors over 20 years ago, this has been Our Mission, Our Passion, Our Life’s Work. Fulfilling this mission would not be possible, however, without our amazing and dedicated team: Ali, Natalie, Suzanne, Ashley and Heather. You have our Personal Promise to deliver excellence in our care and service, utilizing our many years of training and experience, and teaming up with your Inner Doctor, to help you feel, function and perform at your ultimate best! Together, we got your back!